Intense fruit and resin. Citrus, especially orange and grapefruit, cherry, strawberry, pine, resin, and dankness. 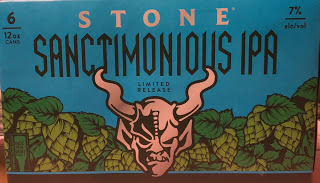 Stone Sanctimonious IPA represents the elevated state of reverence that Stone extols for the venerable and almighty Hop. Amarillo & Simcoe hops have been anointed to bestow their divine qualities on this sacred brew. This limited release is part of Stone’s Hop Worship Series… Glory be to those who imbibe it in its freshest form…and faithfully worship thy Hop in the beauty of blissful bitterness.